The Elsevier Editorial System (EES) provides a number of powerful tools you can use to manage the peer-review process. In this article, we want to highlight some additional EES features – some of which you may not be aware of if they aren’t switched on for your journal. These features have been designed to make life easier for you, your authors and your reviewers, and your Publisher or Journal Manager will be happy to provide more information. EES can be set up to allow reviewers to upload a file to support their review of a manuscript, for example, an annotated PDF in which they have marked up suggestions. When uploaded, the file(s) will automatically be sanitized by EES to ensure the reviewer’s identity is removed from the file properties and any ’sticky note’ comments the reviewer has added. An attachment that is uploaded by a reviewer will only be available to the author with the editor’s approval and the editor can also choose to edit and upload a replacement version. Similarly, editors can upload files to support their decision on a manuscript. These files will be made available to the author when they receive the decision notification. As well as providing additional files, such as an annotated PDF, you could use this functionality to upload a review that was delivered late. Automating this process helps to ensure reminders are sent according to a set schedule, and reduces the effort required by the editor. When an author uploads their submission files in EES, the system can automatically re-order the files so that they appear in the order required by the journal. This saves time for the author and also means that editors and reviewers receive correctly ordered PDFs. When a reviewer receives an invitation to review, they can accept or decline the invitation without the need to log into EES, which saves them time. Did you know that an additional link can be included in EES emails to reviewers, allowing them to access a PDF of the submission without the need to log in? Depending on the policy of your journal, the link can be added to the reviewer invitation or the letter of instruction they receive when they agree to complete a review. This means a reviewer can accept to review, download the PDF, and then begin their review without even logging into EES! 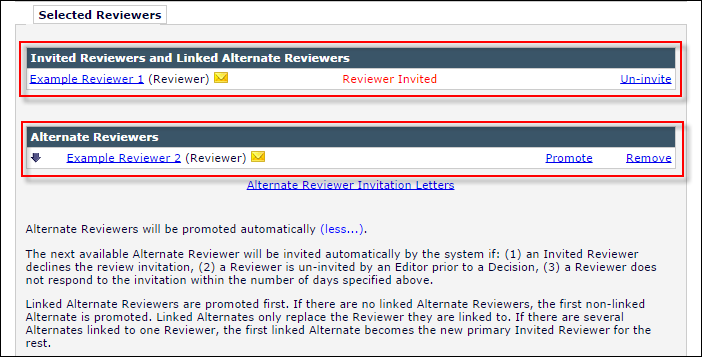 When you invite reviewers in EES, you can also choose to set up ‘alternate reviewers’ – they will automatically receive an invitation to review if one of the original reviewers declines or fails to respond within the time limit. Including alternate reviewers means that you can locate a list of suitable reviewers for a submission upfront and then let EES manage the invitation process for you. Another advantage is that the alternate reviewers will still be available to invite for another submission, if needed. With the Find Reviewers Tool you can easily locate reviewer candidates and import them into EES at the click of a button, where you can add them as reviewers, alternate reviewers, or just keep them as potential reviewers should you want to invite them manually. You can also change the order in which the results appear by assigning each criterion a level of importance. You can find out more about this on our EES Support Hub. For more information on any of these features and their suitability for your journal, please contact your Publisher or Journal Manager. Following graduation from the University of Exeter, Ben Rowe joined Elsevier in 2002. He was initially a Journal Manager and held a number of different roles before being appointed Service Manager for Operations in 2013. Throughout his time with Elsevier, Ben has worked on EES, including providing support to internal and external users. Ben is based in Exeter, UK.